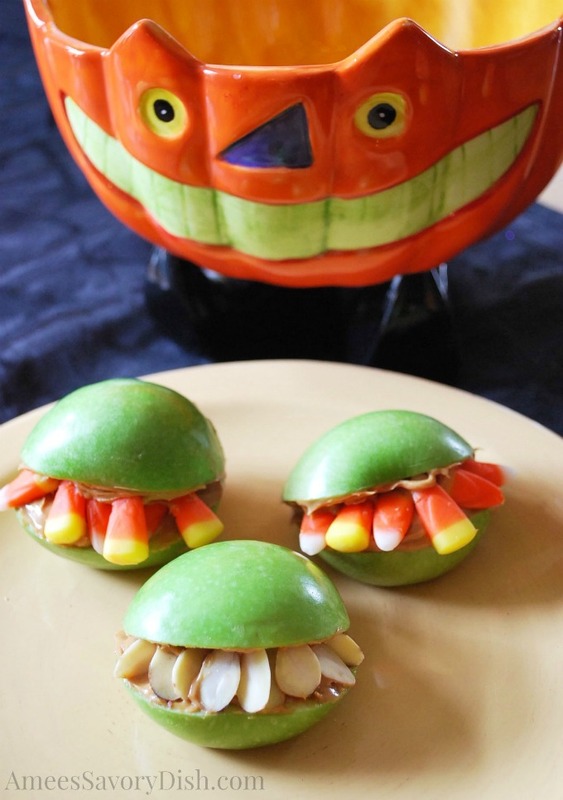 This is a fun Halloween snack for kids and pretty healthy, too. I first found this “monster mouths” idea in a special Halloween edition of Better Homes and Gardens from 2007. I love them and the kids do, too! Almonds and candy corns make great “monster teeth” for the apples. Rinse the apples, then cut them in half. You want to work around the core so that you end up with two flat pieces (on the inside) of about the same size. Now slice a small piece off the bottom of one of your halves so that the mouth will lay flat on the plate. Smear inside of slices with peanut butter and place the “teeth” inside. Enjoy! candy corn or slivered almonds for "teeth"
Rinse the apples, then cut them in half. You want to work around the core so that you end up with two flat pieces (on the inside) of about the same size. Now slice a small piece off the bottom of one of your halves so that the mouth will lay flat on the plate. Smear inside of slices with peanut butter and place the "teeth" inside. Enjoy! How adorable! I love simple and cute ideas like this. Thanks so much for sharing! Hope you’re doing well Amee!